We are huge, and I mean huge fans of ravioli at my house. It's been my favorite food since I can remember. I mean honestly, I was cleaning out some closets this week as an early kick off to my spring cleaning and ran across a file folder that my mom gave me of my childhood school papers she kept. One of them was a questionnaire from second grade. It asked questions like, what's your favorite color, favorite movie, name of your best friend, and of course the old classic, what's you favorite food. "Ravioli" even then I knew a good thing when I tasted it. So, this week as we are getting ready to ring in the new year I thought it would be fun to come up with a new appetizer to serve my family and friends. 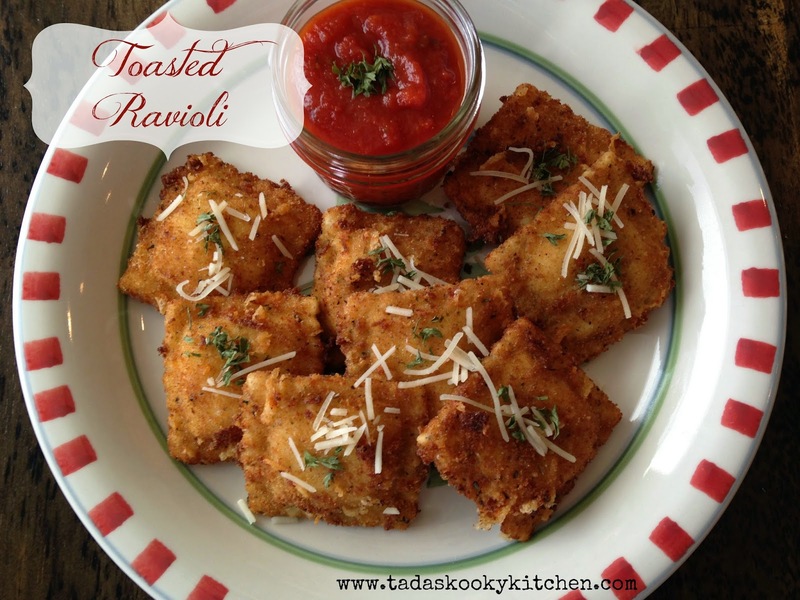 I've seen a few recipes for deep fried ravioli floating around on the web and I've even tried a few but they were each missing a little something. Then I thought of how amazingly well our deep fried zucchini turned out and thought that would be perfect for our ravioli. You can eat these as an appetizer, or a meal, served with a salad. Line a cookie sheet with wax paper. Then roll ravioli in flour mixture, then egg mixture, then bread crumb mixture. Place on wax paper. Do this for each ravioli. Then chill in refrigerator for 1/2 hour. Deep fry in hot oil until golden, drain. Serve with marinara sauce.